It’s the most wonderful time of the year! I get to spend a TON of time in the kitchen baking, cooking and it’s totally socially acceptable! Thankfully for me my kids love being in the kitchen with me, it’s such a perfect way to make memories with them. It’s amazing how much even my teenagers will share when we’re in the kitchen. We have a ton of traditional food we love to make, AND my kids love to help me come up with NEW recipes! My oldest is a HUGE Harry Potter fan! One of the things she and I both have in common is our love of reading! The boys love watching movies with me, thankfully another favorite tradition (in addition to baking and cooking) is watching movies as a family, and I love getting a good series in during the holidays when we have a ton of time together. So we’ve watched the first few movies together (and of course played the Lego Games). ANYWAY the whole family are huge Harry Potter fans so when the kids are I were in Target looking at all the Smuckers Toppings and we were talking about what we could create with each topping option. When we got to the Butterscotch and I brought up butterbeer the kids JUMPED on it! So WHAT kind of butterbeer treat? We played around with a few ideas but fudge WON! We have the thick butterscotch layer then we used the marshmallow topping to create the foam layer… and together you have butterbeer fudge! UPDATE – some people have mentioned in the comments that their fudge was too soft – so I made a video on tips and tricks for fudge. 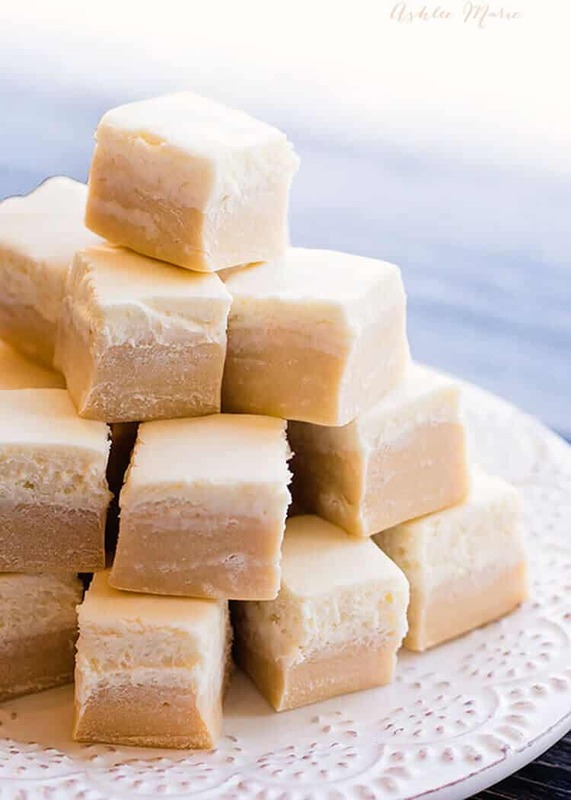 INCLUDING this fudge – I took it to the other extreme while trying to make up for it being to soft and cooked it PAST the soft ball stage and it ended up WAY to hard! Seriously I’ve made two batches already! 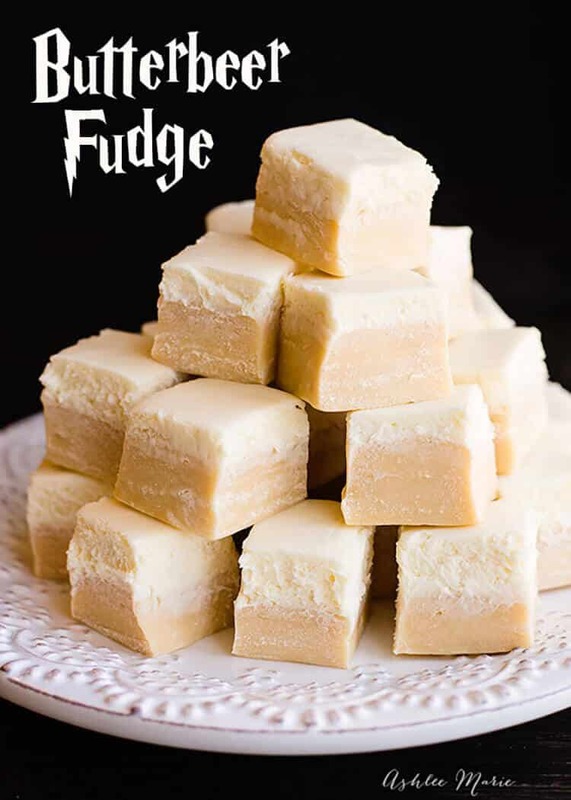 If you like the sweet, creamy, butterscotch flavor of butterbeer you will love this fudge! AND even better? 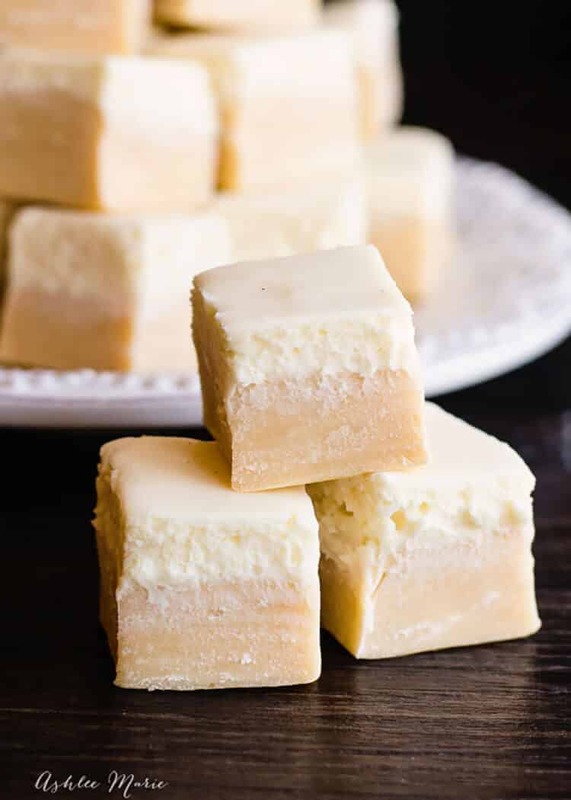 The trick to fudge is to get cook it to the right temperature, to little and it's soft, too much and it's too hard! 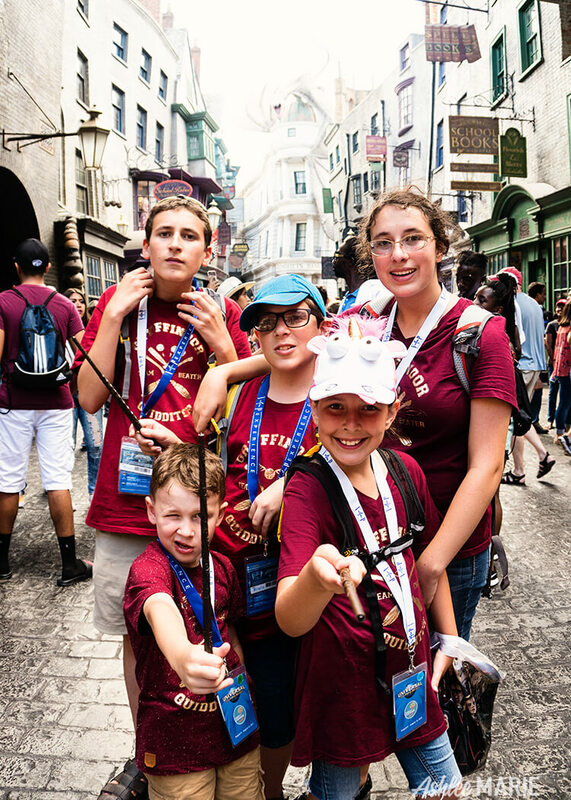 So this summer we were able to head over to Orlando and spend a week a Universal Studios – I will be sharing a LOT more recipes and posts with you – but how happy do my kids look at Diagon alley! We had an AMAZING time and I’m trying to work out going like every year! I recommend going for at LEAST 4 days (about the same price as a 2 day pass so totally worth it) make sure to get the park to park so you can take the Harry Potter train between parks AND spend a day at the water park. Don’t forget to try all 6 butterbeer treats – including a butterbeer fudge! oh no! I’d guess you either 1. didn’t cook the sauce enough before adding it to the chocolate or 2. didn’t add enough white chocolate. Mine too came out the consistency of taffy, really yummy stuff so no complaints at my house; but definitely Not a fudge. What size glass pan did you use? Excuse my ignorance, but I see some of the ingredients in both layers. So, do we need to buy 2 of each thing? Am I missing something?? the marshmallow fluff? it uses one 7 oz jar – 1/3 in the top layer and 2/3rds in the bottom layer – I tried to create the recipe to use just one jar – I hate when a recipe uses partial jars! I’d like to know what pan size you used, what temperature you used, what time you cooked it, and how/how long you let it sit/refrigerate please? I really want to make this for my family and friends for Thanksgiving and I’ve never made fudge. I need to make it again and take a temp reading – that will be more reliable! I’m so sorry to hear that it didn’t thicken up! even with the marshmallow creme and chocolate! that’s really strange! Mine too came out more like taffy than a fudge. Kind of reminds me of a werthers. My question is the marshmallow fluff. Is the 4.6oz& 2.3oz is that volume or weight? I used weight. the marshmallow fluff comes in containers of 7 oz so I pulled out 1/3rd for the topping and 2/3rds for the butterscotch layers. I made a video – I hope it helps – the reason fudge doesn’t set is when it isn’t heated up to the right temperature. I’m planning on making soon. Any suggestions on how to make it less taffy-like and mor fudge-like? Have not made fudge before so I’m trying to cook it right.